Short Brothers of Belfast was founded in London in 1908, and it has since grown into one of the world’s leading aerospace companies. What is not widely known is that the Short family originated in North Northumberland. The three Short brothers – Horace, Eustace and Oswald – were grandsons of William Short, who was born in Tweedmouth in 1803. The history of the family and its Northumberland origins are outlined in the genealogy below. The father of the three brothers was Samuel Short who became a colliery manager in Durham and later moved to work at an ironworks in Derbyshire. Horace Short was an extraordinary scholar. He soon outstripped his teacher’s ability to construe Latin and was able to solve mathematical problems on sight. On leaving school, Horace was employed at the Stanton ironworks, but in 1890 after 2 years there, he set off to see the world and visit his uncle William, who had emigrated to Australia and was responsible for sinking the first of two shafts at Newcastle, New South Wales. On arrival in Australia, Horace wrote home with a full account of his many adventures, not knowing that his father, consumptive for many years, had died in 1891 leaving the family nearly penniless. In 1893 his letter was published in the local Chesterfield newspaper and a fund was set-up to raise money to enable Eustace to try and search for his brother. They eventually met each other in Mexico where Horace was a silver-mine manager. In 1895 Eustace returned home with £500 and a promise from Horace that he would follow as soon as he could wind up his affairs. Eustace, Oswald and their mother moved to London where they used the money to purchase a coal merchant business. A year later, Horace returned bringing with him a sound-amplifying device that he had invented and wished to patent. It was now that Eustace and Oswald became interested in ballooning and they rented two arches under the LBSC (London, Brighton & South Coast) Railway at Battersea Park conveniently located next to the gas-works. 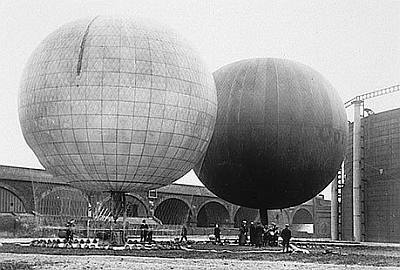 They designed and produced many types of balloons both for racing and touring and thus came to know the active members of the Aero Club of the UK – such as the Hon. Charles Rolls and the Hon. Claude Brabazon. Balloons at Battersea. Photograph courtesy of Bombardier Aerospace, Belfast. Horace however, was convinced that ballooning was a dangerous past-time as the craft were incapable of being steered accurately. Instead, in 1903, he moved to Newcastle-upon-Tyne and became personal experimental engineer on steam turbine development to the Hon. Charles Parsons. Wilbur Wright; photograph taken in 1905. From Wikimedia Commons. In America, the Wright brothers had made over 150 powered flights since their first in December 1903 but little interest was shown in their invention by either the U.S government or potential manufacturers. In August 1908, Wilbur Wright arrived in France with his aircraft and gave demonstration and passenger flights from a site near Le Mans. On hearing about these successful flights, Eustace and Oswald decided to give up ballooning and to start building aircraft, but they realised that they would need Horace in the new venture. Parsons were prepared to release Horace from his contract and the new partnership of Short Bros. was registered at Battersea in November 1908 with a capital of £600 subscribed equally by the three brothers. 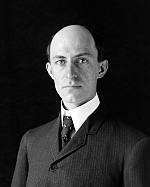 Wilbur Wright had neither manufacturing facilities nor even any drawings of his aircraft and he readily agreed that Short Bros. should have the British rights to build his aircraft. An initial batch of six aircraft was then built – needless to say, all were spoken for by members of the Aero Club before they had even been finished. Thus began the story of Short Brothers who can justifiably claim to be the world’s first aircraft manufacturing company. Today they are part of the Canadian transport and aerospace conglomerate, Bombardier Inc. but are a major international aerospace company in their own right, located at Queen’s Island near Belfast, Northern Ireland. Oswald, Horace, and Eustace Short. Photo (public domain) via Wikimedia Commons. William was baptised 6 October, 1765, Lowick. Adam was baptised 24 March, 1767, Lowick. Isabel was baptised 24 February, 1769, Lowick. Samuel was baptised 24 February, 1769, Lowick. Margaret was baptised 4 February, 1772, Barmoor. John was baptised 28 February, 1773, Lowick. James was born circa 1793, Bexhill near Blyth, Northumberland. Dorothy was born circa 1795, Tweedmouth. Jane was born circa 1797, Tweedmouth. Samuel was baptised 23 August, 1801, Tweedmouth. William was baptised 5 December, 1803, Tweedmouth. Leonard was baptised 10 April, 1806, Tweedmouth. Mary was born circa 1809. John was baptised 23 April, 1812, Tweedmouth. John was born circa 1826. Andrew was born circa 1827, Tynemouth. Leonard was born circa 1829, Tynemouth. Jane was born circa 1832. George was born circa 1835. William was born circa 1837. Samuel was born in the July-Sept. quarter 1840, Tynemouth. Robert was born in the April-June quarter 1845, Tynemouth. 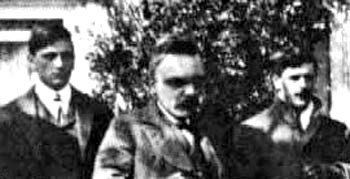 Their son Samuel, like his older brother William, became a mining engineer and sank the shaft, and later became the manager of Little Chilton Colliery in Co. Durham. He married Emma Robinson from Derbyshire and their first son, Horace Leonard, was born at Little Chilton in 1872. Whilst still an infant, Horace suffered a head injury which resulted in meningitis, followed by abnormal brain development and a large deformed forehead; he survived however. In 1875 another son was born and named Albert Eustace (always known afterwards as Eustace). Soon after this the family moved to Derbyshire, where Samuel became chief engineer at the ironworks at Stanton-by-Dale. 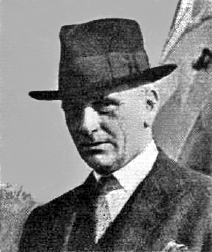 Another son, Hugh Oswald, was born in 1883 and he was also always known by his second name Oswald. These three sons eventually became the founders of Short Brothers. The Short No.1 Tailless biplane was built in 1909. 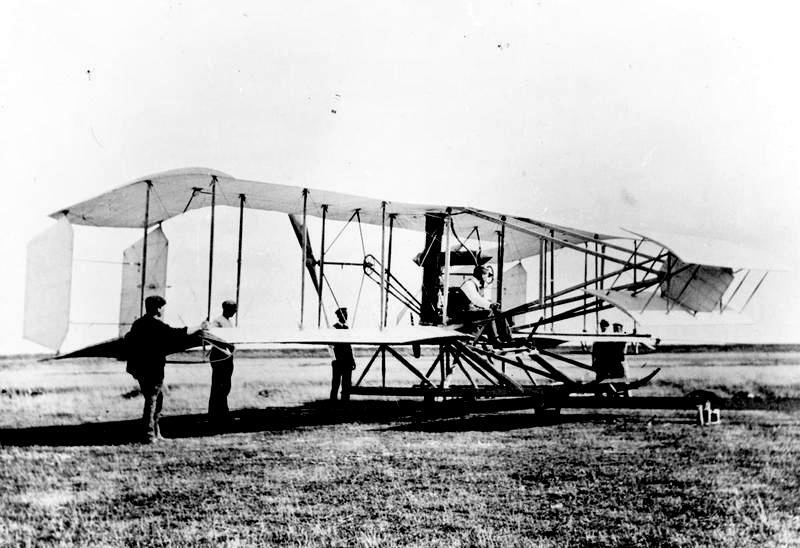 Although it never flew, it is notable for being the first aircraft designed by Horace Short. From Wikimedia Commons. 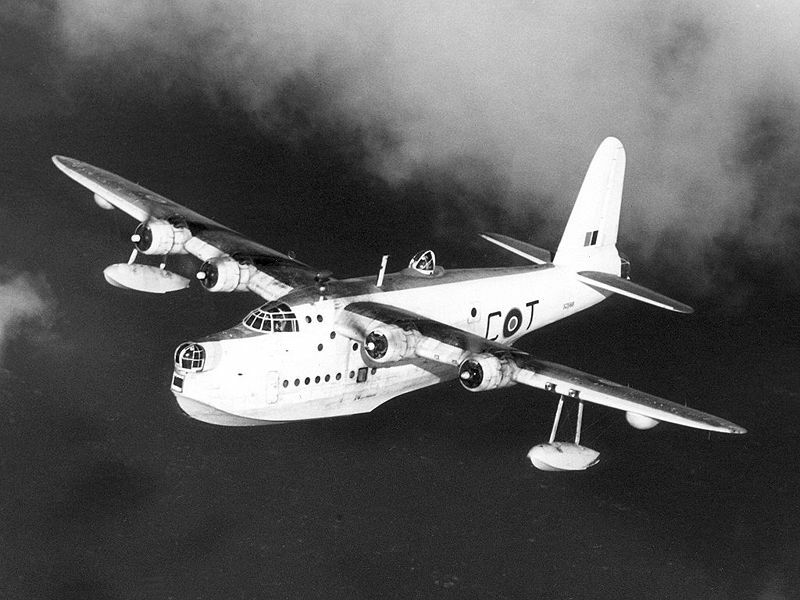 Built by Shorts the Sunderland RAF flying boat first flew in 1939, and was retired from RAF service in 1959. However it continued in service with the New Zealand Air Force until 1967. Photograph from Wikimedia Commons (Crown copyright expired). Thanks to Eric Herbert of Berwick-upon-Tweed, Northumberland, and Straffen Short of South Africa for research on the Short family history. C. H. Barnes. Shorts aircraft since 1900. London: Putnam, 1967. Michael Donne. Flying into the future: a pictorial history of Shorts. Whitley, Wiltshire: Good Books, 1993.